The Husband and I are huge fans of observational comedian Louis C.K.. We have to make sure the kids are well and truly asleep (due to the profanity) but we often end an evening in tears after watching a few side-splitting moments of his stand-up. Early in his career he was hired as a writer for Late Night with Conan O’Brien and a couple of weeks ago he made an appearance on Conan to chat with his old boss. As usual, Louis is spot on with his humour, and he was discussing an issue that is starting to rear its head in our home. Should you buy your child a smart phone? This video has gone a bit viral but The Husband and I only watched it for the first time last night. I can’t embed it for some reason, but please click here to get to the video. If you don’t have time to watch the whole thing, please at least watch the first couple of minutes. I mean it… click over now. But please remember to come back! I just don’t let them have it yet. It’s easy… just say no, you can’t have it. You know, it’s bad for you. I don’t care what you want… I’m not there to make them happy. This is my style of parenting. My kids know that I love them, but my role as their parent is keep them safe and help them develop into the best people they can be. It’s not to ensure that they are happy 24 hours a day and give them everything they want. Learning to do without is an important life skill. I’m not raising the children, I’m raising the grown-ups that they’re going to be. Honestly, I think this is one of the best descriptions of our job as parents that I have ever heard. He goes on to say that he is not going to give his kids things just because “everyone else” has them. For those of you who are parents, you know this is a constant battle. Even though our boys are only 8 and 6, they are already asking for phones and starting to tell us about friends who have them. Who do these kids need to call? No one, that’s who. With questioning, I quickly discovered that the boys want these phones because they see them as a treasure trove of game apps that they can carry in their pocket. 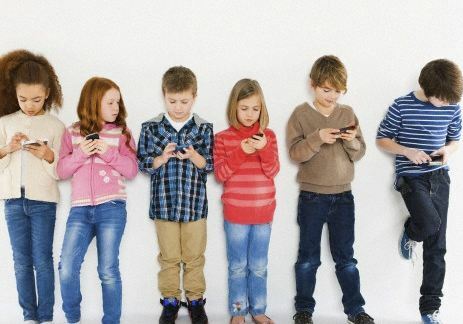 With the “no electronic devices rule” at school and our house “video games only on the weekend” rule, I’m not sure they would really be getting the best use out of a smart phone. I know that I sound old and curmudgeonly when I complain about “kids today” with their phones glued to their hand, but I really don’t think it is healthy. A couple of years ago, I was in play and drove a teenage cast-mate to all of the rehearsals. In the fifteen minutes that it took us to drive to the theater, she would check her phone over twenty times (yes, I counted). C’mon, really! Also, never once in these drives, did she turn her head to look at me or begin a conversation of her own. You might say that was because she was timid, but she wasn’t. She just wasn’t “engaging” with me. Not once during months of drives. Again, Louis sums it up pretty well. You know, I think these things are toxic, especially for kids… They don’t look at people when they talk to them. They don’t build the empathy. Smart phones may be bringing the world to our children’s fingertips, but of what use is that if they can’t even carry on a conversation with the person sitting beside them? At what age do you think it is appropriate for children to have cell phones? This entry was posted in General and tagged comedy, Conan O'Brien, Family, humor, humour, kids, Louis CK, Observational comedy, Parenting, Smartphone, The Husband, Video game. Bookmark the permalink. I love this post and I support you 100% in your “meanness”. Learning to do without is a life skill, and one learned more easily at a young age. Keep the bar low, that’s my motto. Together we will stand our ground, neighbour! Love him!! He has such good observational skills and endearing humor! I love Louis CK! Oh my goodness that man makes me laugh! Yay! Another fan! Have you seen his “Of course… but maybe” bit? So funny!